Name a contaminant, any contaminant, and chances are that the U.S. EPA’s new reference tool has you covered — or at least soon will. The recently revamped Drinking Water Treatability Database (TDB) is set to include more than 200 contaminants, both regulated and unregulated, with detailed information on what they are, where they come from, and how to get rid of them. Currently the database covers 66 contaminants, but its breadth is nonetheless impressive. The site compiles information from thousands of sources, providing general overviews, properties, and fate-and-transport characteristics for each pollutant. In this section you can find your (un)desired contaminant by name, browse alphabetically, or segment by classification (chemical, microbial, or radiological). Note that there are also “Quick Links” for further research — regulatory requirements, health impacts, analytical methods (historical monitoring data), and a link to EPA’s Integrated Risk Information System (IRIS). 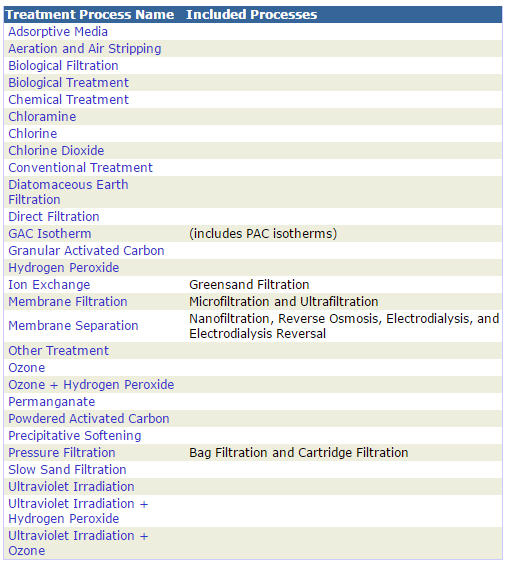 The “Treatment Processes” tab reveals the methods suitable for remediating the contaminant in question. These are processes that are “most commonly employed and those less commonly employed but known to be effective,” according to the EPA. To discover the range of contaminants that each process can treat, it may be more useful to search by technology. Twenty-eight processes are currently covered (shown below), but the section will be expanded with time. Here, valuable process parameters such as dosing, loading rates, and contact times, as well as water-quality parameters such as temperature, pH, and turbidity can be explored. There is much more to the TDB, and much more yet to come. I urge you to browse for yourself. This high-level overview was simply designed to raise awareness of a “cool tool” that the EPA has developed, as well as a nod to the agency for doing so. Often criticized for making the life of water treatment professionals more difficult, the EPA just made the research of drinking water contaminants and treatment processes a whole lot easier.